Want to join us in making a difference for young table tennis athletes? 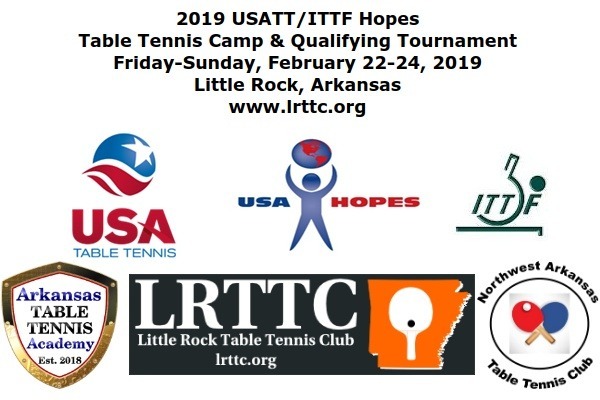 We're raising money for the 2019 USATT Hopes national training camp and qualifying tournament to be held at the Little Rock Table Tennis Club on Friday-Sunday, February 22-24, 2019. Youth participants will receive expert coaching and training from USATT National Coaches for three days in a fun, rewarding environment in which they will have an opportunity to meet peers and share experiences. Any donation will help LRTTC provide a welcoming and memorable experience for the kids and their family. Thanks in advance for your contribution to this cause that means so much to us at the Little Rock Table Tennis Club. Read more about the Hopes camp at LRTTC.org. Your generous donation will help cover facility rental fees and coaching expenses, signs and banners to create a festive atmosphere, three nutritious meals and swag bags for the kids.